“Innovation is not an event. It's not a lab. It's not the perfect day once a year. It's something that's happening 365 throughout your organisation and it's a really hard process,” says Niddal Salah-Eldin, Director of Digital Innovation at WELT. Editors and publishers came together during the WAN-IFRA India 2018 Conference in Hyderabad to discuss if the gap between business and editorial functions of a news media organisation needs to be bridged. Sinead Boucher is making Stuff happen at Fairfax New Zealand, a subsidiary of Australia’s Fairfax Media Limited. Fairfax New Zealand officially assumed the name of its highly popular news site on 1 February 2018. Wijeya Newspapers (WNL) was established in 1979 and is Sri Lanka’s leading newspaper group. With a vision to be the most independent and socially responsible media group in the country, it has the highest annual turnover. “The Wire has strongly believed that philanthropic support is essential to get a boost at the initial stage, but the most important part of our business model was solving the puzzle of how to get readers to pay,” Siddharth Varadarajan, The Wire’s Founding Editor, told Trushar Barot, BBC’s Digital Launch Editor during WAN-IFRA’s Digital Media India 2018 conference in Mumbai. The woeful gender gap in news organisations has been well documented recently, so you can only imagine how that picture looks for women in technology positions at news orgs. Take The New York Times: three years ago when the company had a vacancy for its CTO job, how many women were interviewed? Zippo. “When a company is only doing a diversity initiative to combat a #MeToo movement, it will die.” That is from Dheerja Kaur, head of product for the millennial site, theSkimm. It is just one of many takeaways from a powerhouse Women in Tech session and panel that took place at IFRA World Publishing Expo and DCX Digital Content Expo yesterday. 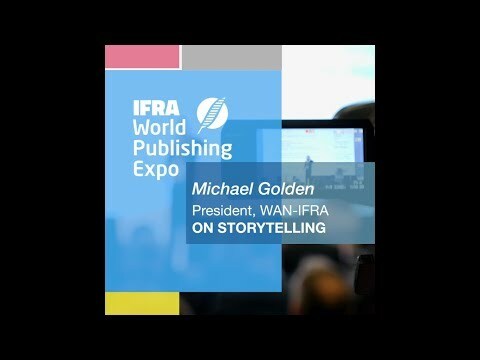 As publishers, "all of the important numbers that we look at are basically proxies for engagement,” said Michael Golden, WAN-IFRA President and former Vice Chairman of The New York Times, during the opening of WAN-IFRA's 48th World Publishing Expo and Digital Content Expo on Tuesday in Berlin.